Job interviews are a lot like speed dating. Candidates essentially get an allotted amount of time to ‘sell themselves’ to the HR leader sitting across the desk. The applicant is probably nervous, anxious, sweaty - worriedly trying to guess what’s going through the recruiter’s head. Do they like you? Do you like them? Is there a future here? Or are you both flogging a dead horse? 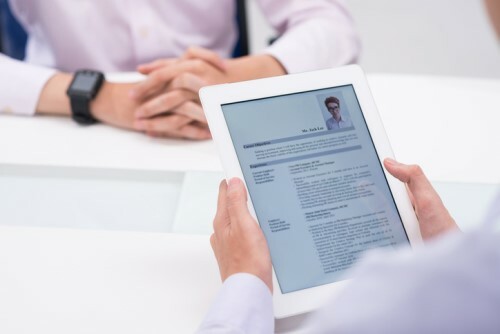 Only by understanding the psychology around job interviews can both sides, HR leader and candidate, get the best they possibly can out of the experience. A recent report from HireRight found that 85% of employers caught jobseekers lying on their job applications, up from 66% in 2012. Whether due to mounting job-hunt pressure or a lack of awareness, this spate of sneaky jobseekers is de-railing the recruitment process, costing organizations thousands every year in bad hires. So, bearing that in mind, what can you as HR practitioners, do to train yourself in spotting CV fibs? The Recruitment Risk Index research found that 71% of candidates are exploiting flaws in the traditional reference checking process. Meaning if you’re not doing the ground work in chasing those references, there’s a high possibility you’re letting bad hires slip through the net. Whilst background checks may seem like an unnecessary pain when you’ve already made up your mind about a candidate – they are important and could be the difference between a terrific hire and a toxic one. In an interview with Fast Company, Sharlyn Lauby, president of ITM Group Inc, claimed that physical ticks could also signal deception. “Short answers and fidgety body language might be an indicator that a candidate is uncomfortable responding to certain questions, such as, ‘Why did you leave your last employer? '” But that’s not always the case–so be careful when studying a candidate’s body language and tone. To hear more psychological insights and top tips on how to future-proof your interview strategy, make sure to sign up for our upcoming webinar with Cheddi Suddith, of SPB Organizational Psychology.